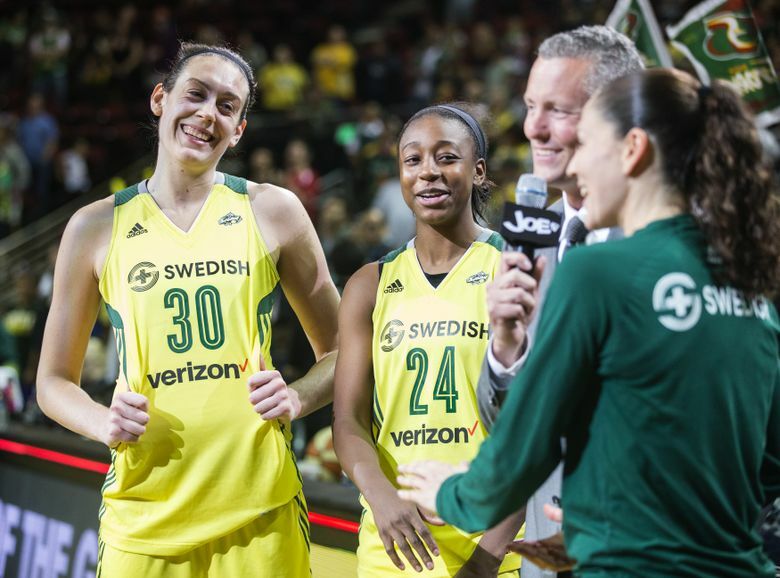 Seattle Storm players Breanna Stewart (30), Jewell Loyd (24) and Sue Bird, far right, pictured in 2016, will participate in the U.S. team’s training camp that starts Tuesday at Seattle Pacific. A week before the start of WNBA practices, 19 of the league’s best players — including Sue Bird, Breanna Stewart and Jewell Loyd of the Storm — will participate in a USA Basketball training camp in Seattle. There will be an exhibition game against China on Thursday. A week before the start of WNBA practices, 19 of the league’s best players — including Storm stars Sue Bird, Breanna Stewart and Jewell Loyd — will participate in a USA Basketball women’s national team three-day training camp in Seattle. Closed-door workouts on Tuesday and Wednesday will be held at Seattle Pacific University, followed by Thursday’s 7 p.m. exhibition game against China’s national team at KeyArena. The training camp is the final tuneup before Team USA gathers for the 2018 FIBA World Cup held Sept. 22-30 in Tenerife, Spain. New Storm coach Dan Hughes is one of three Team USA assistants, along with Minnesota Lynx coach Cheryl Reeve and George Washington University coach Jennifer Rizzotti. Bird and Phoenix Mercury standout Diana Taurasi, a pair of four-time Olympic gold medalists, highlight the training-camp roster. The other Olympic gold-medal winners in camp include: Seimone Augustus and Sylvia Fowles of the Minnesota Lynx, Elena Delle Donne (Washington Mystics) and Stewart. Loyd, who is vying for her first trip to the FIBA World Cup with the national team, needs a strong training camp to secure one of the 12 spots on the roster.